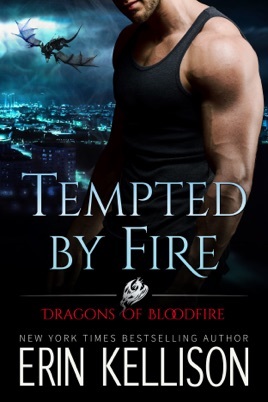 I really enjoyed Tempted by Fire. Erin Kellison’s inventive imagination puts a slightly different spin on the human female/dragon-shifting male trope. The hero is the one who is most tempted, not by dragon-fire, but by the heroine’s fiery spirit. When it turns out she’s more than he bargained for in unexpected ways - well, some temptations are too much to resist…. I enjoyed this writer much more than most paranormal writers out there and I’ve read waaayyy too much paranormal romance, I keep coming back for more though looking for the next interesting storyline and great writers keep pulling me back, this is one of them. I wish the story had kept going or had even more plot development because I was really enjoying the characters she presented. This book is super great. That really covers it for sure. I did not get free anything to write this and I as a rule don't do reviews but sometimes an author new or old hits a home run on something and they deserve the praise and also I want people to see this and give it a try. Ik they're are tons of shifter type books but this one is very original and wonderful world building. I believe this is a new author and I know I want the writing to continue I couldn't wait for book 3 to arrive and am now reading it I have no doubts it will again be worth the money and honestly I'd pay more. Some of these well knowns make a killing and are getting tired and sort of same thing different title this isn't the case here at all. Can't rave enough about this series gets better and better. Intrigued within just a chapter, hooked within 3!! !